Since the demand for high speed data transmission keeps growing, 100G Ethernet has been widely deployed in data center. Designed for high port density with small compact size and low power consumption, 100G QSFP28 transceivers domain the 100G transceiver module market. In the previous post “Focus on 100G QSFP28 Transceiver”, I have introduced four 100G QSFP28 transceiver types—100GBASE-SR4 QSFP28 transceiver, 100GBASE-PSM4 QSFP28 transceiver, 100GBASE-CWDM4 QSFP28 transceiver and 100GBASE-LR4 QSFP28 transceiver. So in this article, I will share cabling solutions for 100G QSFP28 transceiver with you. We know that the above four 100G QSFP28 transceiver types can be divided into two categories according to the interface: 100GBASE-SR4 QSFP28 and 100GBASE-PSM4 QSFP28 are with MTP/MPO interface, while 100GBASE-CWDM4 QSFP28 and 100GBASE-LR4 QSFP28 are with duplex LC interface (shown as the figure below). Therefore, the cabling solutions are different respectively. This kind of 100G QSFP28 transceiver is usually used with MPO cable. For example, 100GBASE-SR4 QSFP28 can support 100G optical links over eight fibers and it can be connected with a 12-fiber MTP/MPO patch cable (four fibers for transmit, four fiber for receiver, leaving four fiber unused). Similar to 100GBASE-SR4 QSFP28, 100GBASE-PSM4 QSFP28 is also used with 12-fiber MTP/MPO patch cable. However, 100GBASE-SR4 QSFP28 utilizes multimode cable for 100 meters data transmission distance while 100GBASE-PSM4 QSFP28 utilizes single-mode cable for 500 meters optical links. Take 100GBASE-SR4 QSFP28 for example, the following figure shows that two 100GBASE-SR4 QSFP28 transceivers are connected with a multimode 12-fiber MTP trunk cable. 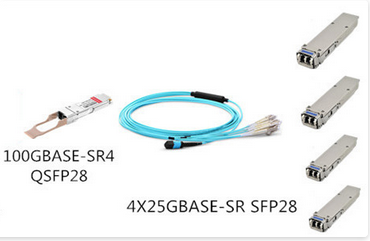 The following figure shows that with the use of multimode MTP-LC 8f fanout patch cord, one 100GBASE-SR4 QSFP28 transceiver can be connected with four 25GBASE-SR SFP28 transceivers. Structured with duplex LC interface, 100GBASE-CWDM4 QSFP28 and 100GBASE-LR4 QSFP28 are usually used with single-mode patch cables with LC duplex connectors. When upgrading the network, we often meet the problem that we have to replace all the fiber patch cables. However, you do not have to worry about this issue if your transceivers are 100GBASE-CWDM4 QSFP28 and 100GBASE-LR4 QSFP28. Common single-mode duplex LC patch cable can meet the cabling requirement of these two transceivers. The following figure shows that two 100GBASE-CWDM4 QSFP28 transceivers are connected with a single-mode duplex LC patch cable. 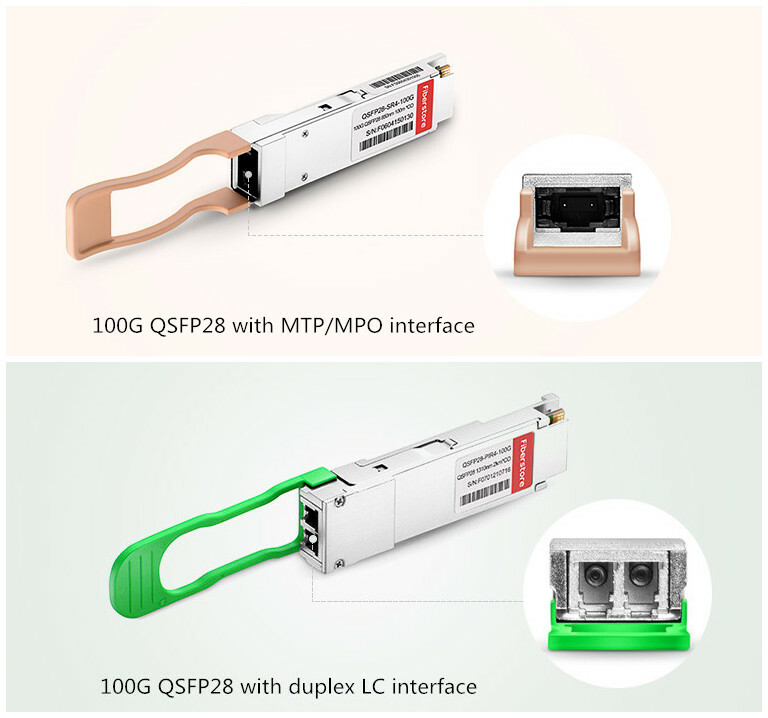 For 100G QSFP28 with MTP/MPO interface, you can choose MTP/MPO cable, but remember that 100GBASE-SR4 QSFP28 utilizes multimode cable while 100GBASE-PSM4 QSFP28 utilizes single-mode cable; for 100G QSFP28 with duplex LC interface, you can use duplex LC patch cable for long distance transmission. I hope after reading this article, you can get something helpful. The transceivers and fiber optic cables mentioned above can be found at FS.COM. For more details, you can visit our site. Why Not Use QSFP28 Transceiver for Your 100G Network? This entry was posted in Uncategorized and tagged 100g MPO cable, 100G QSFP28 transceiver, MTP-LC 8f fanout patch cord on May 18, 2017 by Admin.